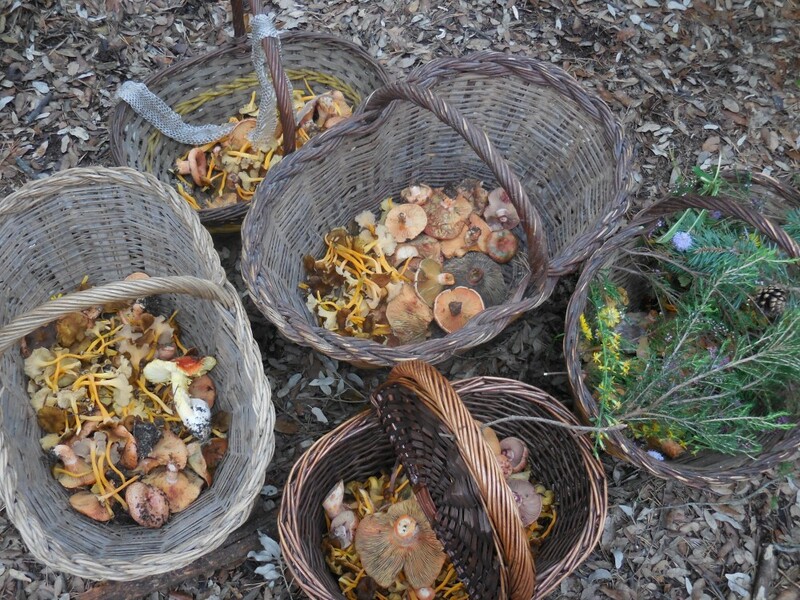 Share the post "Hunting for Mushrooms (Not the Magical Kind) in Barcelona"
My second year living in Barcelona, my host family asked me “Hey, want to go looking for mushrooms in the mountains?” I thought they were joking, but it turns out that it is a super popular activity in the autumn here in Catalonia. If there’s one thing I’ve learned in all of my travel experiences, it’s that it is almost always better to say “yes” to an opportunity. And so off we went to Montseny, a mountain range near Barcelona. My first concern, of course, was the fact that there exists many toxic and/or hallucinogenic mushroom varieties. When I asked my host family about this, they assured me that we’d be going with some “experts” (aka friends they know living in the mountains) who know the difference between the edible and inedible varieties. As a side note, they also mentioned that there are reports every year of people dying from eating the wrong types of mushrooms – so proceed with caution. Only consume wild mushrooms if you know for sure that they are of the edible variety! When we arrived to the mountain, I couldn’t believe how many mushrooms I saw all around! White, yellow, brown, red… they were everywhere! It took me at least 30 minutes to find my first edible mushroom all on my own. It was such a simple thing, but it felt like such a huge accomplishment! To remove the mushroom, you either try to pull it up carefully by the stem, or if necessary, you can use a small blade to cut it at the base. It is common to carry a basket with you to collect them all. We hiked around the mountainside for a good 3 hours or so, the enthusiasm only dwindling when our hunger started rising. We headed back to their friend’s house and dropped off the mushrooms for an extra few sets of “expert” eyes to look over the mushrooms (better to be safe than sorry! ), just to double-check that we didn’t accidentally pick up a poisonous variety. Once we were given the OK for our mushrooms, we drove back to Barcelona and decided to enjoy the camagrocs in a Spanish omelette. It takes a surprising amount of work to cut and clean them all. And of course, once we put them in a pan, they shrunk considerably. But it was rewarding to eat what we had scavenged ourselves! The following day, we cut up the rovellóns and pinetells, which I still can’t tell the difference between. We also added in 2 ous de Reig, which the family’s expert friends had kindly added to our basket without our knowing. The host dad sauteed them all in olive oil, and even though we started with what seemed like a big amount, we each only got a small spoonful of our bounty. But it was tasty, and I highly recommend the experience! To learn more about mushrooms in Catalunya, visit the official site here. Boy, you guys collected a lot! I often see people picking them along side the roads in certain parts of Germany and also when I lived in Montana. I bet they’re way more fresh and tasty than store bought! Thanks for linking up with #TheWeeklyPostcard! Right?! Next time I’ll have to try and collect a lot more! And that should be awesome! I look forward to seeing pictures. Foraging for food is not new but has taken a sort of chic appeal to the modern hiker. This sounds like fun but I would not trust myself knowing the edible from the inedible or downright dangerous mushroom type, so I would be in need of one or more pair of expert eyes. Yes, I’m definitely with you – I don’t think I’ll ever dare judging the mushrooms for myself! I was even a little suspicious of the “experts,” but thankfully all turned out well. Growing up in Transylvania, I used to go mushroom hunting in the late summers. I wasn’t an expert, but a few varieties are always easy to recognize, no bad mushroom looks like them. Last time I visited, I was there at the right time and ate a lot of fresh mushrooms. They are my favorite food, but they never taste the same when I buy them at the store. Thanks for sharing on #TheWeeklyPostcard. Wow, must be some great memories! Sounds delicious, definitely making me crave them, unfortunately I only have store bought mushrooms at the moment 🙁 Thanks for sharing and stopping by! This looks like so much fun. It must have been so rewarding to cook and eat something that you have foraged yourself. #theweeklypostcard. This seems like such a fun experience! I think I don’t trust myself enough to not poison myself by going out and picking my own mushrooms, but with some experts it seems like a fun (and tasty!) activity to try! Yummm! I love mushrooms so much, and they must be even better fresh. Do you notice different flavours as well? I’m obsessed with mushrooms, too! But before this I had really only tried the basic ones that you can find at the store. So this was definitely a treat! They definitely had different flavors and even textures. My favorites with the rovellons because they are nice and meaty! The camagrocs with nice too, but too small! Have you ever tried wild mushrooms?